H&H Homes has a new all natural gas home development just Off Hwy 90, near Hwy 22. 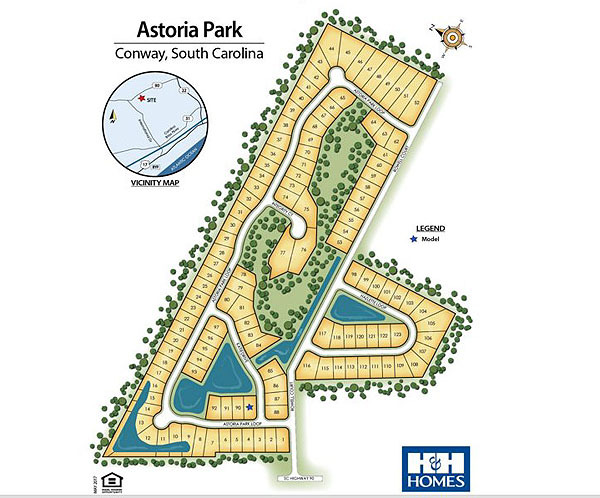 Astoria Park is in a great location, convenient to both North Myrtle Beach, downtown Conway, and Restaurant Row. It's also outside the city limits, keeping taxes low. Life in Astoria Park will be a dream. The homes are 3 and 4 bedrooms, single story ranch style, or 2-story Colonial. There are seven different home plans, ranging from 1500 to 2700 sq ft, with prices from $200,000 to $300,000. Stainless steel appliances, granite counter-tops, 2-car garages, and coffered or trey ceilings are standard with all models. Exteriors come with vinyl siding and brick veneer trim. H&H offers a 10-year builder's warranty with all their homes. The community has 4 large ponds, and many of the homes are directly backing the water. Children will attend Waccamaw Elementary School, Black Water Middle School, and Carolina Forest High School. If you're looking for a brand new home built to your specifications and in a great community, Astoria Park homes may be just what you need. Call us for more information or to tour the neighborhood.